BMS math whizzes (l-r) Colin Zhao, Gautam Gupta, and Kevin Cao with teacher Svetlana Ryzhik. 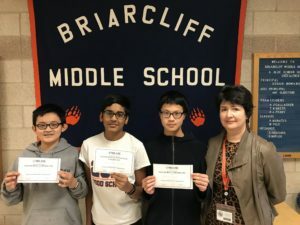 Briarcliff Manor Middle School boasted three top scoring students in this year’s Mathematical Association of America AMC 8 – a 25-question, 40-minute, multiple choice examination designed to promote problem-solving skills. The AMC 8 provides an opportunity for middle school students to develop positive attitudes towards analytical thinking and mathematics that can assist in future careers. 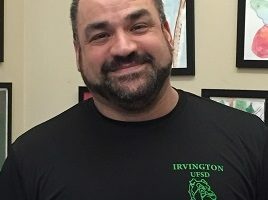 Students apply classroom skills to unique challenges in a low-stress and friendly environment. Seventh grader Colin Zhao and eighth grader Kevin Cao both scored in the top five percent. Seventh grader Gautam Gupta managed to score in the top 1% of students nationwide. Ryzhik added, “It’s a privilege to work with this outstanding group of students…” She invited all to stay tuned for Math Olympiads and Math Counts in February.